Postgraduate students and staff from the Archaeological Computing Research group are currently working with staff and students from Winchester School of Art on a new collaborative venture which will see the two departments sharing expertise, facilities and most importantly ideas. Led by Gareth Beale and Nicole Beale from Archaeology and Ian Dawson and Louisa Minkin from WSA the project aims to get students from both campuses to think differently about how they do research. 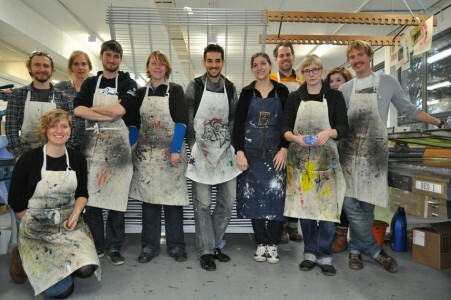 Group photo of artists and archaeologists at the WSA print studio. The project, funded by SotonDH and the University of Southampton Humanities Public Engagement Fund represents creative ‘bottom up’ approach towards the planning of greater collaboration. Through a series of hands-on workshops and field schools students and staff will develop new ways of sharing and interpreting data as well as designing exhibitions and publications which draw upon the skills of both groups. The goal of the project is to engender collaboration between groups and individuals which is sustainable in the long term and based upon mutually beneficial exchanges of data, skills and ideas. Workshops The project will take the form of a series of workshops and events administered by staff and PGR students from Archaeology and Winchester School of Art. The workshops are designed to be creative and to expose participants to different ways of working with data, objects, materials and technology. The first of these events was held at the ACRG and provided staff and students from WSA with a chance to learn about 3D recording and imaging technologies used within archaeology and cultural heritage. The second event held on the 30th of November at the WSA Print studio was a huge success and will see art and archaeology student’s work exhibited on Campus. Staff and students from archaeology will work side by side with WSA print specialists to produce creative re-interpretations of archaeological images and data. The results of this workshop will be exhibited at the Vice Chancellors residence alongside work produced by WSA students. Further events will be held throughout the summer related to an archaeological fieldwork project to he carried out at Basing House in Hampshire in collaboration with Hampshire County Council. This excavation and survey will be a joint WSA/Archaeology field school with students from both institutions benefitting from the expert advice and new facilities available at Hampshire County Council. The project will involve documenting the site using a combination of 3D imaging techniques and photographic recording techniques. This project will end with an exhibition which will involve creative re-use of archaeological data (raster and 3D) captured using laser scanning and photogrammetry. Data In collaboration with the JISC DataPool project the team will also be sharing best practice in the documentation and management of the data produced, and considering issues of selection and retention in the light of disciplinary practice. We hope that the innovative nature of this collaboration will help to develop attitudes towards the value of data and the importance of data lifecycle management. Most importantly we hope to demonstrate the additional value which can be added to research through thinking creatively about new ways of collaborative working.